My previous GH2 tutorial catered to people just getting into using PTool to modify settings for their Panasonic GH2 (and get much better video quality in the process). This next tutorial is more like “the story so far” in terms of ongoing testing. 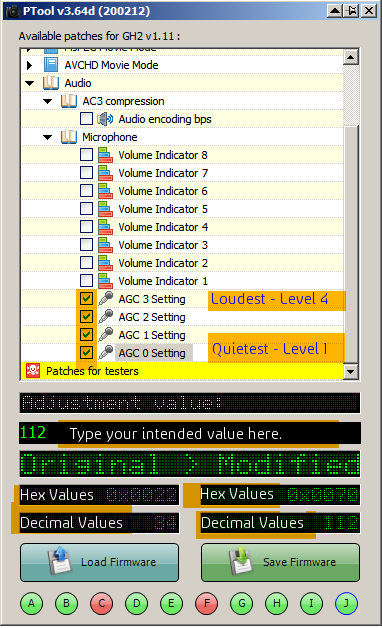 It caters to advanced users already familiar with PTool and looking to modify the gain options beyond what the factory settings allow. Here is the new (decimal value) PTool data gauging the peak noise level of the camera when a 2.5mm cable is plugged in but no device is connected. Note that the same value may go +2/-2 dBFS in noise for each test, depending on the fluctuations – this is not a “clean” environment test but just intended to home in with broad strokes. Remember, those first numbers are the decimal versions of the numbers. That’s the format you enter them in. But the ones to pay attention to, are the resulting hexadecimal numbers they get converted to (the top 2 boxes out of the 4 at the bottom in PTool in the earlier graphic). These numbers all start with “0x”. All of the values I’ve provided read “0x00__” where the “00″ is an attempt to turn off (or at least reduce) the “automatic” part of the “automatic gain control”. Also, in “0x00__” the “_” is the two digit number the gain is divided by (at least that’s the working hypothesis so far based on the limited testing I did months ago). At the higher values (such as 235) it seems it may attenuate the input signal (though this will not keep an overly high input signal from clipping). Also note how unpredictable the dBFS values become for decimal numbers below 112. Files for advanced testers below (you know who you are).